Founded in 1908 as the University Farm, UC Davis became a general campus in 1959. UC Davis is located on the southern edge of Davis, California, 15 miles southwest of Sacramento and 90 miles northeast of San Francisco. The core campus lies north of Interstate 80 and east of Highway 113. At approximately 5,300 acres, UC Davis is the largest of the University of California campuses. Current enrollment planning for the UC Davis campus forecasts a potential student population of about 39,000 by 2027-2028. The residential rental market in the City of Davis is severely constrained with less than a 0.2% vacancy rate in the 2016-2017 academic year. In 2015-2016 more than 9,400 students, approximately 29% of Davis enrollment lived on campus; about 5,250 traditional first-year students (freshman) lived in residence halls while another 4,150 upper-division undergraduate and graduate students lived in apartments. In addition, UC Davis master leases additional beds in the City of Davis to accommodate transfer students. 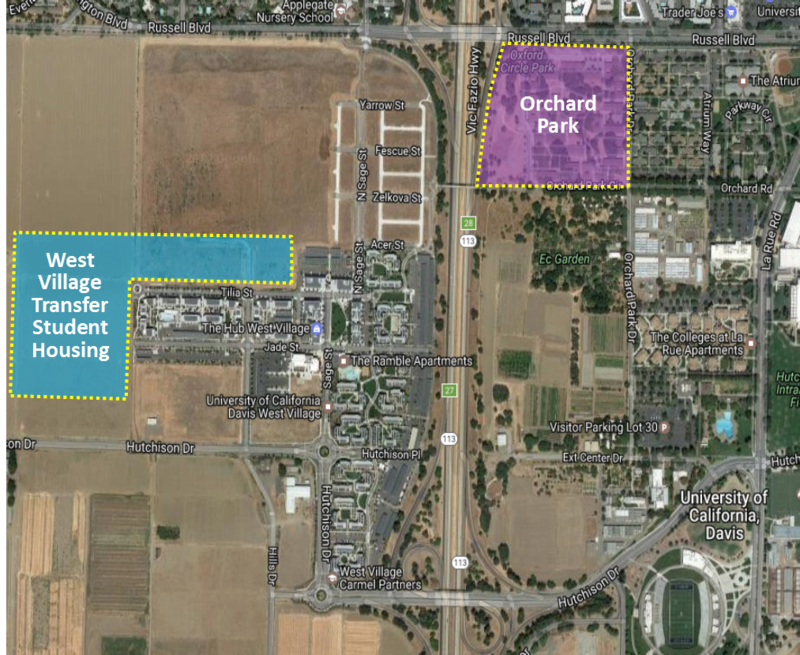 The two projects envisioned by UC Davis will be the Orchard Park project and the West Village Transfer Student Housing project ("Project" or collectively, “Projects”). The Orchard Park Project will provide 200 affordable two-bedroom apartment units to serve UC Davis student families, married students or students with registered domestic partners, and a target of an additional 700 beds for single graduate students. The West Village Transfer Student Housing Project will provide a target of 1,875 beds of apartment-style student housing, a majority of which (approximately 1,000 beds) will be master leased back to the UC Davis campus to serve the large transfer student population. Respondents to the Stage 1 Request for Proposals (“RFP”) may respond for either one or both Projects. Through this RFP, the University intends to select a Developer or Developers with whom it may negotiate and enter into a ground lease or ground leases and/or other agreements for one or both Projects. The selection process will be conducted in two stages. A short list of Developers will be selected from those Developers responding to this Stage 1 solicitation and will be invited to respond to the Stage 2 RFP. Stage 2 of the process will include detailed pro formas, a design charrette and an additional Developer interview. While the University intends to proceed with the development of these Projects in the manner described above, the University may, at its sole discretion, choose not to proceed with the Project or Projects, or to proceed with the Project or Projects without a third-party Developer, without obligation or liability to any Respondent to this Stage 1 RFP. The University reserves the right, in its sole and absolute discretion, to (a) modify or cancel the selection process at any time, or not award this Project or Projects for any reason; (b) waive minor irregularities; (c) seek clarification or additional information from Respondents as it deems necessary to the evaluation of the response; or (d) request any additional information from individual Respondents. This Stage 1 RFP does not create any legal rights or obligations between the University and any Respondent hereto nor any obligation to proceed with negotiations. It is intended that all legal rights and obligations between the University and a Respondent will come into existence only if and when a definitive agreement is signed and delivered by both parties. Respondents to this Stage 1 RFP shall bear all expenses in connection with their submittals and responses.